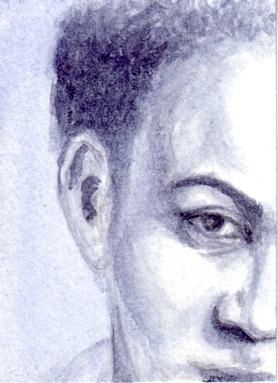 For a recent trade I was asked to do an artist trading card of half of a face. So I used the least expensive and most available model I know–me! And very effective it is too Mellanie. You are very good at self portraits. I have never got the hang of mine somehow. Thanks Cathy! I’m glad you like it. wonderful texture in the hair. Thanks! I like how that came out too. Thanks for stopping by ronell. I’m so glad you enjoyed the picture. Maybe I can do one for you. I’ll send you an email. Thanks for stopping by!